PARENTS: This documentary is sponsored by Break the Hold, The Mental Health Association of Westchester, Films on Purpose and Pleasantville Strong. The screening will be held at the Jacob Burns Center. This is a FREE event. There is limited seating. RSVP REQUIRED. CLICK HERE TO REGISTER ONLINE. Please bring your ticket with you to the screening. 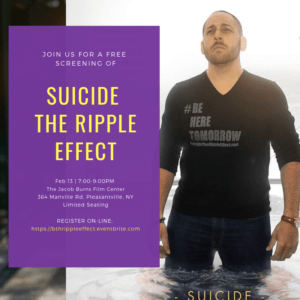 “Suicide: The Ripple Effect” is a feature length documentary film and MOVEMENT, currently in production, focusing on the devastating effects of suicide and the tremendous positive ripple effects of advocacy, inspiration and hope. Research has shown that for every one suicide death, over 115 people are directly, and secondarily effected and the financial cost of suicide in the US is estimated to be over 40 billion dollars annually. Suicide is global public health crisis that is not receiving the attention it deserves and therefore millions continue to die and the ripple effects of these deaths continue to devastate parents, children, families, friends and communities. This film is uniting and igniting change that will have a tremendous positive impact on reducing the number of suicides and suicide attempts around the world. It is not just a film; it is a movement.